When the author and illustrator fight over what happens in the story, what do you suppose is the result? 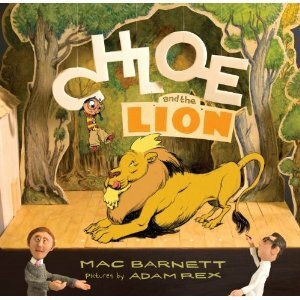 This wacky, mad-cap picture book, Chloe and the Lion. The book begins innocently enough: with Chloe wanting to ride the carousel and then getting lost in the forest. But as you continue to read, you quickly realize that this story isn't about Chloe at all. Adam and Mac's argument over creative license soon takes over the entire book and Chloe's dilemma gets put on the backburner. This is one of those books that will benefit kids by rereading it to them. Even my sixth graders, who are more sophisticated readers than the primary crowd this book is written for, asked me to read it to them a second time because they were so confused by some of the things that were happening in the story (the idea of a meta-story is a new concept to them). Still, once we discussed everything that was going on (the story within a story), kids started to see the humor and got into quoting certain parts of the book (they especially loved the motif of telling the author, "A dragon would be so much cooler"). This would be a great book to talk about the concept of allusion with students because there are instances where Chloe encounters characters and situations from other works of classic literature, and I was surprised at how much my kids knew what they were when I asked them about it. I love the trailer! And I assume that's just a preview of the book. What a great idea. I love the idea of introducing kids to meta analysis. What a great find! This book would be terrific with the right teacher (or parent.) I'm sure a lot of it would go over my kids' heads, but I can see with help that it would be great teaching tool.